The following are a sampling of instructional programs offered by Wiland Associates, LLC. Each program can be customized to meet the needs of organizations or customers, and will remain compliant with the National Incident Management System (NIMS)—Incident Command System (ICS) course requirements. 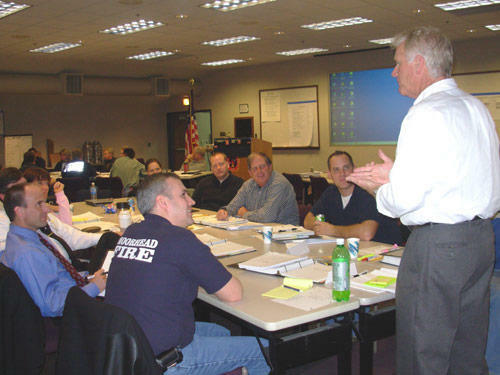 NIMS ICS 402—This course is specifically designed as an orientation for the organization executives and public officials, and offers a full explanation of how the NIMS-ICS functions. Roles and responsibilities of senior officials are described and information on expectations and performance metrics for emergency responders are listed. NIMS ICS 100—This course is intended for personnel who would be assigned to an incident where only an introductory level understanding of NIMS-ICS is needed. The course reviews the terminology and common responsibilities of all personnel. NIMS ICS 200—This course describes the principles and features of ICS, organization overview, incident facilities, incident resources and responsibilities associated with assignments. This course is designed for managers of first-level supervisor positions. NIMS ICS 300—This course describes the incident organization and staffing, incident resources management, and incident/event planning process. This course is designed for personnel who would hold supervisory positions. NIMS ICS 400—This course consists of five modules describing the formation of the Command and General Staff, Unified Command, Major Incident Management, Area Command, and Multi-Agency Coordination Systems. This course is designed for senior level personnel who would function in management positions on a complex incident. Command and General Staff Functions for Local Incident Management Teams—This complex simulation course is designed to familiarize members of an incident management team with the concepts of incident management, planning and analysis, team interactions and dynamics, and functional responsibilities for information exchange and communications. This course is designed for command and general staff members of a local incident management team. All Hazard Incident Management Team Training—This course is designed by the USFA, as a series of simulation exercises and instruction for incident management team members. The simulations are designed to test the students in their functional knowledge, as well as their ability to function as a team. Instruction is provided to enhance their abilities to interact, communicate, make decisions, improve risk management and reduce errors. All Hazard Incident Management Team Workshop—A three day course designed to develop and exercise All Hazard Type 3 Incident Management Teams through lecture, demonstrations, and exercises. This class will greatly improve IMT internal procedures and team communications. The concurrent functional workshops will reinforce concepts of the AHIMT course and provide in depth instruction on how to actually perform under emergency conditions. Command & General Staff Position Specific Training—This is a series of courses designed for each member of the Incident Command and General staff. The Courses provide in-depth instruction on roles and responsibilities, interactions and communications, and staff management. These courses are designed for senior level incident managers. The positions include: Incident Commander, Public Information Officer, Liaison Officer, Safety Officer, Operations Section Chief, Planning Section Chief, Logistics Section Chief, and Finance/Administration Section Chief.